I first caught a glimpse of the multiple, identical rings trend on Andy's style scrapbook a few months ago. I have not been able to take my mind off them since then. Scoured several online and mall-based accessories shops but haven't found any yet so I decided to give it a try and make them myself. It's a fun quick project that takes less then 5 minutes to complete. Pry off appropriate length with pliers. Re-attach and wear with pride! Hope you enjoyed this quick DIY! If you have any suggestions on how I can improve it, feel free to drop me an email. Have a great Sunday! Don't forget to join my giveaways! Great DIY! Thank You for sharing!! this DIY is really helpful! <3 great entry! Great DIY! 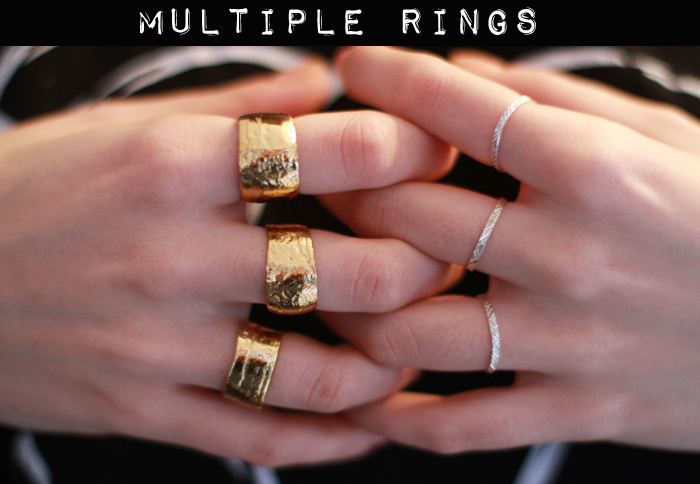 It's like a knuckle bracelet but for your ring areas!